A beautiful teak six-drawer chest by Westnofa of Norway. Highly figured teak veneer with black inset handles. 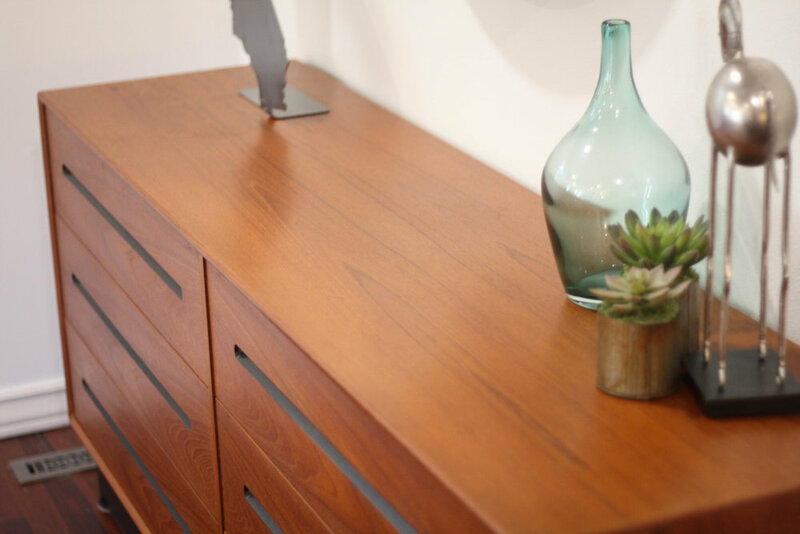 Bookmatched drawer fronts show an amazing grain pattern that carries across the drawers and makes this not just a dresser, but a piece of art. Original Naugahyde black plinth base. Retains Westnofa label on the back of the dresser. Drawers slide perfectly and this thing is in as close to new condition as you can get with very few imperfections. A small hairline scratch to the top and one darker spot about the size of a quarter. Excellent vintage condition and as good as they come for being 50 years old. Matching nightstands available in a separate listing.